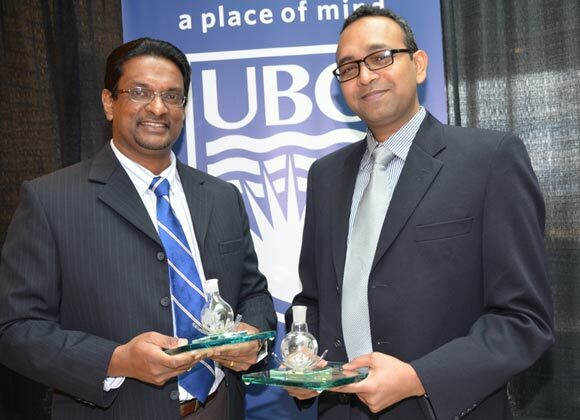 Kasun Hewage and Shahria Alam, researchers at UBC Okanagan’s School of Engineering, were presented with the Moldovan Award for their ‘green’ thinking initiatives. Two researchers at UBC’s Okanagan campus are being recognized for their efforts to reduce the flow of materials destined for landfills. Associate Professor Kasun Hewage and Assistant Professor Shahria Alam of the School of Engineering have been named recipients of the Moldovan Memorial Award to honour their dedication and efforts to bring green ideas to their classrooms and research projects. Judit Moldovan, a long-time UBC employee who dedicated herself to make the university environmentally sustainable, passed away in September 2011. She was a founding member of the UBC Okanagan Green Research Advisory Committee overseeing sustainable practices on campus. Both Alam and Hewage have research projects investigating ways to keep materials out of landfills. Alam’s work involves recycling used concrete, composite scrap, and crushed/mixed materials as aggregate for fresh concrete. Hewage, a key investigator with UBC’s Life Cycle Assessment lab, has launched a study with the City of Penticton to conduct energy reviews on city buildings, and is developing software that will help the city improve overall energy consumption. The project examines the everyday use and reuse of consumable items like pens, batteries, electronic appliances, and other items that may end up in a landfill. For their innovative work Hewage and Alam each win $1,000, which was presented by members of the Green Research Advisory Committee Thursday. Moldovan played a key role in building the chemistry program and her responsibilities and contributions increased as the Okanagan campus grew to the point where she supervised 30 staff and organized more than 120 lab sections. She has also assisted in the development and delivery of the biochemistry labs, and helped design and commission the new chemical bunker and chemistry labs in the Science and Charles E. Fipke Centre for Innovative Research buildings. While the Moldovan Memorial Award is a one-time honour, the Irving K. Barber School of Arts and Sciences’ chemistry department has established the Judit Moldovan Annual Teaching Assistant Award presented each year to chemistry teaching assistants who stand out in their efforts to help students succeed in their research.